10/7/2008Share this story on Facebook! Filibuster: The use of extreme dilatory tactics in an attempt to delay or prevent action, especially in a legislative assembly. Fourth Estate: The public press. Gerrymandering: To divide a territorial unit into election districts to give one political party an electoral majority in a large number of districts while concentrating the voting strength of the opposition in as few districts as possible. GOP: Grand Old Party, the acronym for the Republican Party. Incumbent: The holder of an office. Lobby: A group that works to influence the passage or defeat of legislation. Mugwump: An independent in politics. Pundit: A learned person or authority. Spin Doctor: A person responsible for ensuring that others interpret an event from a particular point of view. The Washington Semester Program is open to juniors and seniors who have a minimum cumulative GPA of 2.75. Students may earn up to 15 credits in the fall and spring and 6 credits in the summer in a variety of academic programs, including internships in all disciplines. The train car screeched to a stop, the brakes let out a slow hiss, and the doors slid open. I stepped off the train and into the dark, haze-filled tunnel, people swarming around me. I was dressed in my new suit and tie, and my briefcase contained a couple of folders along with maps of the city. I was hesitant, but I felt like a million dollars. 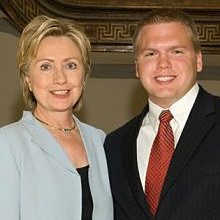 It was my first day as a United States Senate intern in the office of Senator Hillary Rodham Clinton. The humid Washington, D.C., air hit me as I left Union Station and made my way to Capitol Hill. I walked through the park, through the main security entrance, and up to 476 Russell Senate Building, the oldest of three Senate office buildings, to meet my fellow interns. That morning would be the beginning of a summer that would change my perspective on government, policy, and politics forever. My time as a Senate intern began doing the tasks that many interns do -- answering mail and phones and giving tours. I enjoyed hearing from New York State constituents and other concerned Americans on a variety of issues ranging from the war in Iraq to health care. I quickly learned and adjusted to the pressures of meeting deadlines and preparing for legislation to hit the Senate floor. I also adapted to the help-out-or-get- out-of-the-way mentality and the competitive intern environment that comes with Senate culture. After putting in time answering mail and running errands, my background in agriculture and 4-H led me to spend the rest of my summer working for Senator Clinton’s agriculture policy adviser. In my new role I helped research the 2007 Farm Bill, attended food stamp hearings, and sat in on briefings and meetings related to agriculture, while learning about other areas of concern in rural America. I also helped draft legislation that made provisions for people who become farmers. I had the chance to talk with constituents concerned about horse slaughter, learn about carbon bonds, and investigate the bee crisis. I even had the opportunity to talk with New York State 4-H participants about my time in the Senate and agriculture in New York State. Every day was new and more exciting than the one before. The internship program gave my fellow interns and me a chance to meet and observe staff members involved at all levels and areas of the Senate. We had lunch with advisers during which we discussed health care, defense, appropriations, foreign affairs, and other topics. At the end of the summer, after observing Senator Clinton talking with constituents, speaking at hearings, and passing in the hallways, we finally had the opportunity to sit down as a group and personally talk with her. The experience was unforgettable. On my last day, I walked through the Capitol building, observed proceedings on the Senate floor, visited the Capitol Rotunda, and soaked in the history and greatness of what happens on Capitol Hill. As I walked through the park toward Union Station for the last time, I took one look back at the buildings that had educated me about our government and cemented lifelong friendships with my fellow interns. 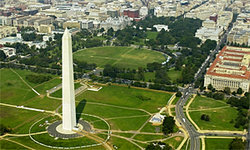 I looked over toward the National Mall where I spent Thursday evenings playing on the Hill’s Angels Senate softball team and then descended on the escalator into darkness, where I met the train for my last ride up Connecticut Avenue. 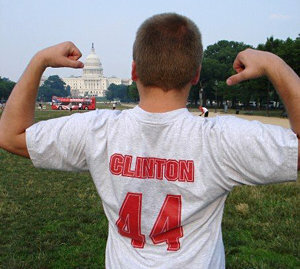 My summer in Washington, D.C., sparked a political flame within me that I never knew existed. I left my experience in Senator Clinton’s office with a new appreciation for what every good government official sets out to do when he or she wakes up in the morning. The internship helped me to better understand legislation and how it relates to my major in health policy studies. I left with a new understanding of the complicated legislative system, the importance of reaching compromise among many diverse interests, and a passion for participating in the political system. 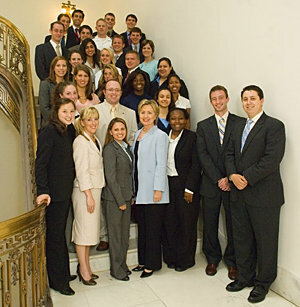 My summer in Senator Clinton’s office lead me to be involved in her presidential campaign as an official campaign representative for Ithaca College, sparking trips to New Hampshire and Pennsylvania to spread the word about her service in New York and generating many phone conversations with Americans across the nation. And even though she failed to win the Democratic nomination, she made those 10 weeks in Washington, D.C., and time working on her presidential campaign, fulfilling and memorable. I wouldn’t trade that for anything.